Rocky III (1982) is the third installment in the Rocky movie series, starring Sylvester Stallone, Carl Weathers, and Talia Shire. Rocky III features Mr. T, who plays the character Clubber Lang, a contender who has some characteristics of a classic boxing villain whose human side is usually hidden by his loudness. It also features Terry "Hulk Hogan" Bollea as the character Thunderlips, a role which helped popularize Hogan. Rocky III begins with an opening montage of scenes that explains what happened in the time between Rocky II and Rocky III. 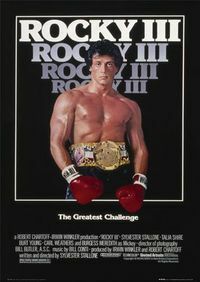 5 years after the events of Rocky II, Rocky Balboa, has become the new heavyweight champion of the world, begins a run of title defenses, and mowing down ten straight opponents from around the world. As his win streak grows, so does his fame and celebrity, as Balboa is soon seen everywhere, from magazine covers around the world, to print ads, television show appearances, t-shirts, and his own "Crunch Punch" chocolate bars. At the same time, Clubber Lang (Mr. T) is climbing the ranks becoming the number one contender for Balboa's title. Rocky�s brother-in-law Paulie (Burt Young) has grown jealous of Rocky�s accomplishments. After a night of drinking, Paulie stumbles into a video arcade, comes across a ROCKY pinball machine, and destroys its frame picturing Rocky's likeness. He is arrested. The next character we see is a neatly-dressed Rocky Balboa bailing Paulie out of jail. After a discussion, Rocky gets Paulie a job. Rocky agrees to a charity boxing/wrestling match with wrestling champion, Thunderlips (Terry "Hulk Hogan" Bollea). Rocky treats the whole affair as light-hearted fun, Thunderlips, however, is still in his wrestling character, and grabs Rocky and attacks him with a variety of wrestling moves. After being thrown out of the ring, Rocky decides to remove his gloves and fight back with several punches to his stomach, and throwing Thunderlips out of the ring. After the match, Thunderlips breaks kayfabe and grants Rocky a Polaroid picture, stating "that's the name of the game". Rocky has a statue unveiled in Philadelphia and reveals his plans to retire. Clubber Lang, who is in attendance at the ceremony, challenges Rocky yet again, this time criticizing Rocky�s title defense as being fixed. Rocky agrees to the fight, but has to beg Mickey, his trainer, to get back in the ring with him. Unfortunately, Rocky allows his celebrity status to get in the way of his training. Lang and Rocky meet at Philadelphia's Spectrum. During a melee before the fight, Mickey is inadvertently shoved into a rail by Lang, and suffers a heart attack. Rocky wishes to call the fight off, but Mickey urges him on while he stays in the dressing room. At ringside, Apollo Creed is on hand for commentary. By the time of the fight, Rocky is both enraged and severely distracted by his mentor's condition, and despite attacking Lang fiercely in the beginning of the first round, without direction, Rocky is easily knocked out by Lang in the second round, losing the title. When he returns to his locker room, he and Mickey have their last conversation, and Mickey, refusing medical treatment, passes away. Rocky, still feeling pain over the loss of his trainer, goes to Mickey's gym once more. While there, Apollo Creed convinces Rocky to challenge Clubber again, only this time Creed will help him train. Creed�s only condition is that Rocky will owe him a favor when it�s all over. Apollo takes him to the slums of Los Angeles, so that Rocky can get back to the basics. Rocky does not have it in him to train hard anymore, but, after a talk with Adrian, he pulls himself together to train as hard as he can. In the rematch, with Rocky 10 lbs lighter, Rocky fights with a level of skill and fighting spirit that no one, including Clubber Lang, expects. Defying Lang, Rocky intentionally takes a beating, gambling that Clubber Lang will tire before Rocky is knocked down, which frustrates Lang. Defeating Lang with a knockout in the third round, he recovers his world heavyweight championship and his self-respect. Sometime after the fight, Rocky and Apollo return to Mickey's gym, with Apollo revealing his favor: a third fight with Rocky. However, this would only be a sparring match between two friends. The film ends with Rocky and Apollo circling the ring, and freeze-framing just before each prepare to hit the other.